Always Bagels has been making authentic New York style bagels for more than 25 years. Their bagels are always boiled.. the “old fashioned” way which produces a bagel that far surpasses the rest. Family-owned and operated since 1985. Their bagels are available in all of the standard bagel flavors as well as many special flavor varieties. Always Bagels is certified Kosher Parve. 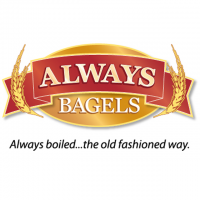 Visit them @ www.alwaysbagels.com for more information.